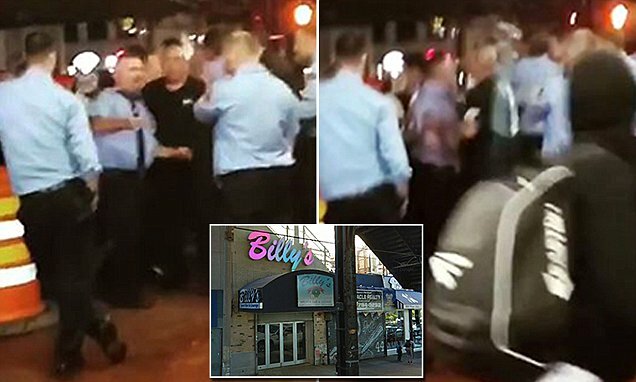 Uninformed firefighters got into a massive brawl while off-duty at a bar close to Yankee Stadium on Wednesday. The incident occurred at Billy's Bar in The Bronx, New York, between the Rescue Company 3 and the Ladder Company 49 and Engine Company 68. The latter two share a stationhouse nearby in the Bronx and the bar is a popular destination for police officers and firefighters. According to an anonymous source, the fight broke out after someone called a black firefighter n****r.
At least one of the firefighters involved in the altercation had to be maced by bouncers at the bar while they tried to calm the fight. Police were then called to the scene as the fight escalated to outside, with bystanders capturing the chaos that ensued there. The footage shows the drunk firefighters flinging slurring as they argue with each other and look disheveled. As the firefighters continue with their belligerent squabble, one can be seen pushing police officers trying to break up the fight. Witnesses can be heard asking where the cops are and why none of them are getting detained by the police. And it was reported that there were no arrest or police reports made for the scuffle. But those at the scene who witnessed the ordeal can't really fathom why no one was detained.